The more ethically minded traveller may be thinking about their air miles, or the CO2 equivalent as they sit in traffic jams. 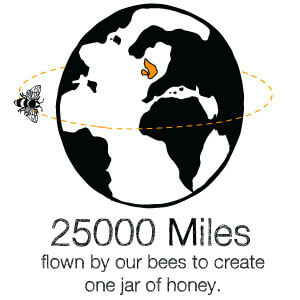 We’re always thinking about air miles here at Plan Bee, not the weighty kerosene ones, but the miles flown by our bees, which is the equivalent of flying around the world just to make one jar of honey. And as for jams, well that’s not really what we do. For those feeling even slightly guilty, and looking to offset their carbon use from that package holiday flight to sunnier climes then Plan Bee may well have a solution. By adopting a bee you could be helping to offset tonnes of carbon, as our little pollinators jump from tree to tree and plant to plant ensuring new life can thrive. It is widely accepted that young trees absorb more carbon from the atmosphere and that CO2 intake increases among seed and fruit producing plants after pollination. And, that plants also consume more CO2 when they are producing nectar. With bees covering a potential area of 28-square-miles then that’s a potentially large carbon offset. For companies also looking to make an impact on their carbon offset there’s also the opportunity to adopt a hive from Plan Bee. We already meet the sustainability needs of many household names, supporting their environmental programmes. With each business taking a minimum of 120,000 bees that racks up to a huge carbon offset for just a small investment. Many organisations will look to offset their carbon use after the event, such as a large constructions but by adopting our beehives your business is taking a proactive stance, meeting the needs of the environment before any impact has been made. Plan Bee can even offer school talks and community engagement. Hives can be decorated by primary school and nursery children, or they can carry corporate branding. So as you prepare to jet off to the sun this weekend, spare a thought for our busy bees, and think about offsetting that holiday flight by adopting a bee.